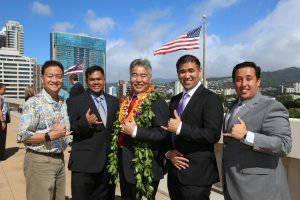 (from left) Burt Lum, Gerome Catbagan, Gov. Ige, state Chief Information Officer Todd Nacapuy, and Jayson Hayworth from the ETS Code Challenge. Three years ago, we set out to make government more efficient, effective and accountable to the people. One of the more exciting ways we’re doing this is through a program with the Office of Enterprise Technology Services. To engage the local tech community in the modernization of state government, we began a Code Challenge. We brought local talent together to develop modern tools and computer applications to improve government services for the public. One winning team converted visitor scheduling at OCCC, which was being done with Post-its and pens, to a web-based, self-service process. The new concept created by a group of Honolulu Community College students is far more efficient and is being developed into an application that works better for the staff, inmates and their visitors. One of my duties as governor is to be a responsible fiscal manager, and I am proud of this administration’s efforts to put the state on sound financial footing. We’re building financial reserves for a rainy day that help to reduce future financial strain on taxpayers, and we’re making sure we keep our promises to our seniors in a responsible way. I know we can work together to craft a responsible budget that is not my budget, not the Legislature’s budget, but the people’s budget.